Simon Hwang-Carlos shines as a pianist who has excelled in his studies at Greenfield Community College. Today, Simon, 22, of Montague, will receive a 29 Who Shine Award from Governor Charlie Baker at a ceremony at the Massachusetts State House. GCC President Bob Pura nominated Simon for the Award which recognizes outstanding graduates from the Commonwealth’s public higher education system. Simon studied at GCC for three years, maintaining a 4.0 grade point average, and will graduate in June with an Associate’s degree in Music. 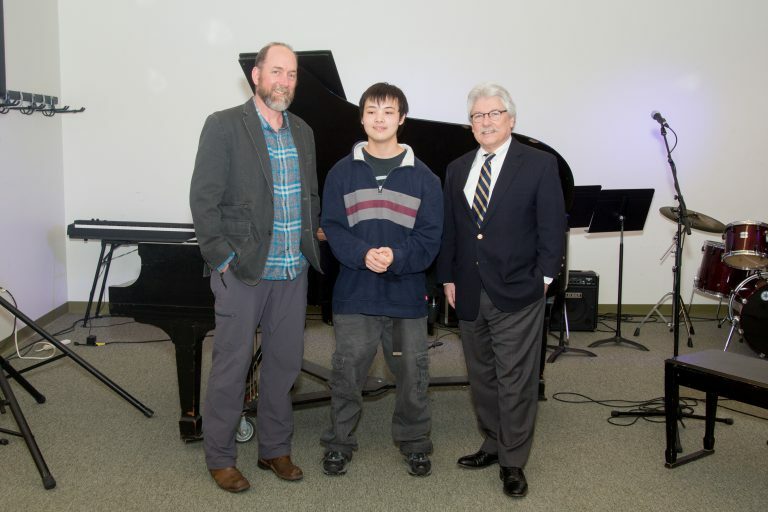 He has been awarded a scholarship to study toward a Bachelor’s degree in piano performance at the University of Massachusetts Amherst. Each 29 Who Shine Awardee is asked to name a most influential campus mentor. Simon’s mentor, GCC Music Department Chair Matthew Shippee also will be recognized at the Award ceremony. “The 29 Who Shine honorees are exceptional student leaders who saw a way to improve something and acted on it, and for that we are grateful. They are a credit to the colleges and universities they attend. We are proud of their contributions to their communities and the Commonwealth,” Education Secretary James Peyser said.